Interview with One Of You. One of the most intriguing re-issues of recent times arrived early last year via the Portland, Oregon-based label Little Axe Records (a label founded when Mississippi Records split into two labels in 2011), with it’s issuing of a self-titled LP by One Of You. The author’s name and identity remains anonymous but we do know this startling collection was made by a Czech immigrant to Canada who set up her own Scarab label in the early ‘80’s, releasing music under the pseudonyms One of You and The Triffids. Having fled her homeland in the late sixties to emigrate to Canada for hopes of a better future and life there, One Of You’s music would be imbued with a prevailing sense of loss, regret and much hardships. The music itself, written in both Czech and English, and arranged in typically minimal fashion (synthesizer, guitar, organ) touches upon outsider folk, folk-psych, Eastern European folk and minimalist music traditions. One Of You’s deeply affecting, timeless music yields moments of powerful intensity while a whole spectrum of emotions, images and textures are unleashed beautifully upon the listener all at once. 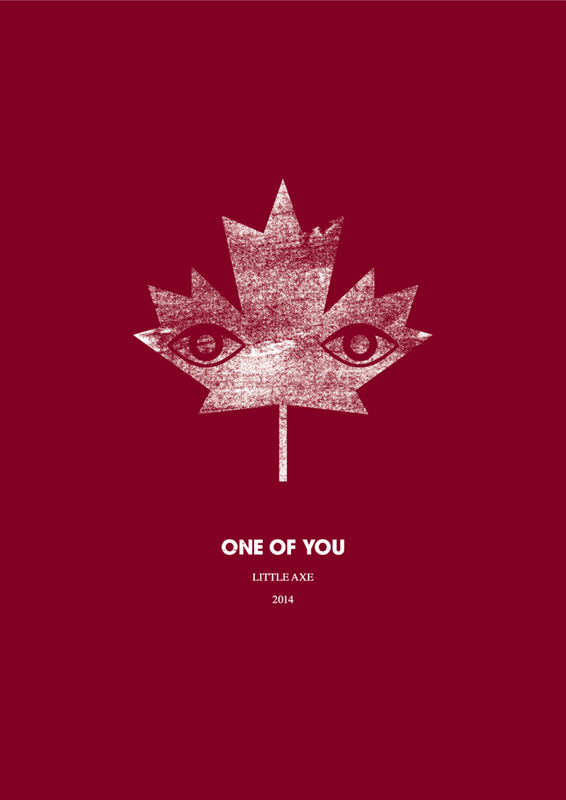 ‘One Of You’ is available now on Little Axe. It is a real pleasure to ask you some questions about your unique and deeply touching music. Can you please take me back first of all to the beginning of One Of You. I would love to gain an insight into the influences and inspiration that found its way into your own music please? One Of You: Growing up in Eastern Europe under socialist regime I had a false impression (typical to most young people there) that the West must be good, full of good people, everything is nice and honest. Realization of the truth that people are same everywhere, good and bad, mostly bad, there is no perfect place on this planet was what created the feeling of despair reflected in my songs. There is something very magical about your voice and the added organ instrumentation. Songs such as ‘Faded Flowers’ and ‘When The Sun Comes Up’ cast an everlasting spell. Was this the first instrument you began to play? I wonder were these intimate recordings made at home? I love the purity and sheer emotional depth that permeates throughout. OOY: I wrote those songs with the help of guitar on which I knew 3 chords. I never mastered any instrument really. Then I arranged these for organ, which I never learned to play, but I somehow had to. These more organ-based songs were released originally as separate singles on your own Scarab label in the early 80’s. What are your memories of recording these particular songs? I would love to learn more about the Scarab label and indeed what releases did you release during this time? OOY: It was all recorded in the dining room of our house on 4track reel to reel recorder. The Scarab records was created just to release these records at the time. Scarab released the total of 3 singles, which are all part of this record. I absolutely adore the instrumental opus, ‘Brainbroom’. This sonic creation feels so current and certainly belongs to the here and now. Please discuss the instrumental music aspect of your output please? How does the creative process change (if so) from the vocal-based songs? In terms of the musical equipment and technology at your disposal, what was your set-up like? OOY: ‘Brainbroom’ was recorded in the same environment, only with additional bass, guitar and percussion with the help of my husband. Technology was pretty much the same. The creative process can be described as fooling around, accidentally coming up with a motive and then building on it gradually. 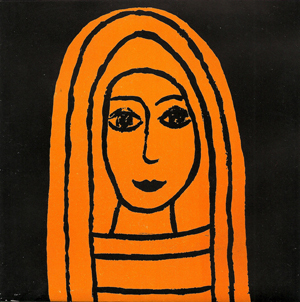 The recently released One Of You compilation was my first introduction to your utterly beguiling works of art. It must be a lovely feeling to have a label such as Little Axe to introduce your music to a new generation of music fans worldwide. Please talk me through the album cover artwork? It’s really beautiful and shares a similar aesthetic to your spellbinding music. OOY: The connection with Little Axe was the work of my daughter. For some reason she adored those songs since the childhood and kept showing them without my knowledge in her circle of friends until she succeeded to make someone interested. As for the artwork. At one time I had painted my room black and orange and I painted the face on the board with the same colours. The picture somehow survived several moves, until we were making the recordings and we decided to use it not only for the cover of the first single but also as a logo for Scarab records. It is the same as on the cover of the new Little Axe record. The second single’s cover was a picture expressing my desire to protect the planet and all its inhabitants. That is the picture on the brochure. Several of the tracks on the compilation comprise of instrumental Triffids tracks. I love the wide-ranging sonic terrain you masterfully venture down. Here, there are gorgeous additions of synthesizer and warm percussion. Were you joined by any other musicians or was it very much a solo DIY process? Please take me back to your first introduction to the Triffids and indeed why you chose to interpret their music? OOY: The Triffids was a creation of me and my husband just for fun, since we already had a studio setup in our dining room. All the tracks were added one by one. So the Triffids was us, so was their music. The fun was that the Triffids was only two of us. Side B consists of guitar-based demos recorded in the late 70’s. Can you take me back to this period of your life – the late 70’s and where these songs came from? Like your organ-based songs, the combination of your ethereal vocals and rich tapestry of guitar notes forms a heavenly sound. OOY: These were only meant to be only as a record for me. There were created at the beginning of the 70’s from the deep despair with the state of the World and in the mid 70’s we put them on tape so they do not get lost, not to be released. The gorgeous ‘Life Is A Puddle’ transports me to Vashti Bunyan’s ‘Waiting For Another Diamond Day’ such is its delicate beauty. I love the added use of flute here. It feels like the beginning of an enriching journey. I would love for you to talk me through this song and the central themes? Also, is there a common theme present across these earlier works of yours? OOY: In that song I still have a deep conviction that people can be much better that they actually are. It was an expression of a need to wake the people up to reach their potential and be as good as they can be. Now I have less and less hope for this, seems people are getting worse and not better. As for the flute, we wanted to add the flute, so we placed an ad in the Pennysaver and this girl responded and created the track for us. Unfortunately we no longer remember her name. Do you have particular favourite records or artists that you feel served inspiration in the pursuit of your own art? How much an influence was Eastern European folk music on One Of You? The guitar-based songs seem to be steeped in this otherworldly spectrum of enchanting sounds. OOY: Not really. I just wanted to express myself. I am not aware of any influence but who knows. Looking back on the musical output of One Of You, what are your most cherished memories? You must feel deeply proud of the artistic works you have created and released into the world. Do you see this music in a new light as you think about One Of You today? hopeful for humanity at that time than I am now. I just realized looking at the Saint Georges ribbon lying on the table that it has exactly the same colours as the picture on the cover of the record. It must mean something, perhaps there is hope which I cannot see yet.